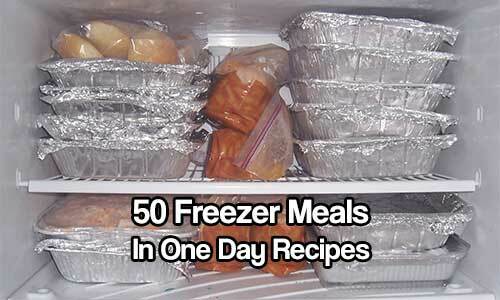 Check out this amazing collection of 50 freezer meals in one day recipes. Freezer meals are just so handy to have. They can save you time and actually save you a lot of money on food. If you cook in a big batch you save money on the electricity, gas, washing and water also the time spend standing at the cooker everyday is reduced considerably. I found a great website that has over 50 freezer recipes that can all be made in a day. Imagine coming home at the end of a long hard day at work and having meals ready to just cook and serve? Yes please. If the power goes out a well stocked freezer stays cool longer so the more you fill it the colder it stays. This is a great little tip to know as a power outage can last from a few hours to a few days.